ARLINGTON, VA, June 17, 2016 — For soldiers manning armored vehicles, assessing their operational environment is challenging. The vehicles they’re in are noisy, and the soldiers are surrounded by tons of steel, with only a limited view outside. Spotting the enemy in rough terrains and dense environments, identifying friend from foe, and tracking enemy movements can be a daunting task. But what if in the future soldiers could see directly outside the vehicle without having to expose themselves to enemy fire or other hazards? What if there was technology so advanced it allows them to effectively see through all that steel, as if it wasn’t there? And what if they were able to share what they are seeing with others to increase situational awareness? That future has arrived. It’s called BattleView 360. 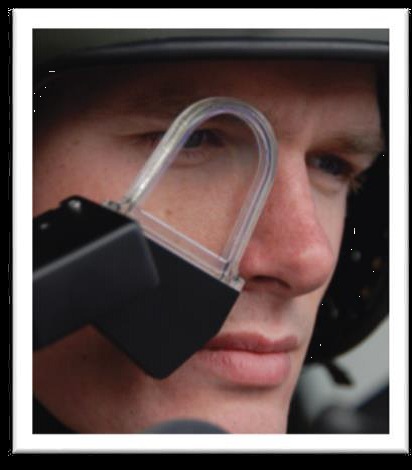 The head-worn part of BattleView 360 can also be used by dismounted soldiers to relay information back to the vehicle. Courtesy of BAE Systems. BattleView 360 is an agile situational awareness tool developed by BAE Systems that employs advanced monocle and imaging technology, providing soldiers with a 360-degree, real-time view outside of their combat vehicles. External optical sensors operating in normal vision or infrared feed imagery to a helmet-mounted display that synchronizes with head movements and stiches together a complete picture of the battlespace. Soldiers can also plug in a tablet display to BattleView 360 to digitally collate, map, and classify various features on the battlefield to track their environment. Better knowledge of surroundings brings increased combat effectiveness and survivability, enabling safer route planning, speedier communication and information sharing, and more rapid targeting. In addition, soldiers can share what they are seeing with other crew members or their commanders to boost response time. The head-worn part of BattleView 360 can be synced to vehicle cameras to provide a see-through capability in both visual and infrared. BattleView 360 builds on years of innovative work at BAE Systems to improve situational awareness by integrating information into a single source, reducing management workload on the crew. The technology is leveraged from our see-through display and digital moving map products. For many years, aircrew have been able to see the real world augmented with symbology — first using head-up displays and then, more recently, with helmet-mounted displays such as our Striker® HMD for fast jet pilots. BAE Systems is now working toward displays for the land domain such as with our Q-Warrior® HMD system and, now, with Battleview 360. For the management of situational awareness objects and other tasks like route planning, BattleView 360 employs digital moving map technology developed for fast jet cockpits. We have combined and adapted these key aviation solutions for land use, designed for reliability and optimal performance. As a result, BattleView 360 revolutionizes land vehicle situational awareness. BattleView 360 has been successfully tested on a CV90, but through open architecture interfacing it’s capable of adapting to any vehicle type and integrating with operating systems. It has been demonstrated on the U.S. Army’s Bradley Infantry Fighting Vehicle. More recently, BAE Systems integrated BattleView 360 with a UAV, further enhancing situation awareness by capturing ground developments from the airspace.